I don’t eat a lot of potatoes these days. Sometimes I think I’ve jumped on the anti-carb bandwagon a little too enthusiastically. When I was a kid potatoes were served at almost every meal, the only thing we probably ate more of was rice. I do believe that it’s not always the potatoes that are the culprit but all the stuff that we pair with them, tons of butter, oil and cheese. 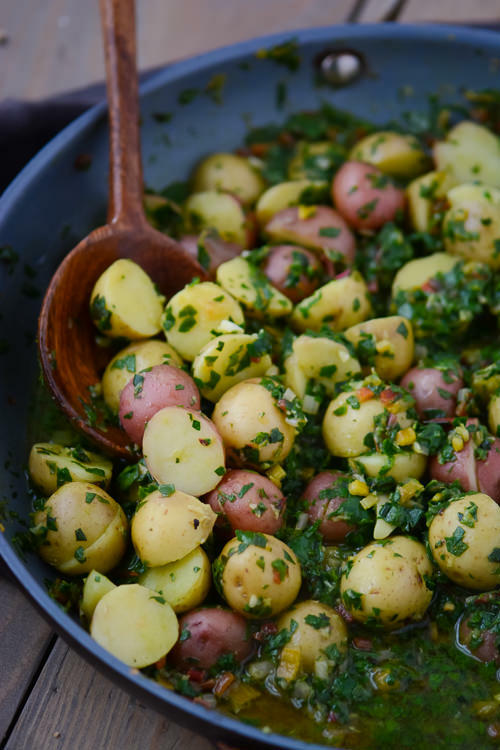 This recipe is my attempt to enjoy potatoes but pair them with things that will give them lots of flavor without a lot of extra fat. The potatoes are cooked in lots of sautéed garlic and finely chopped chard and finished off with a light vegetable broth. They totally filled that comfort food desire but weren’t too heavy and the garlic broth made me want to slurp up a whole bowl of it. 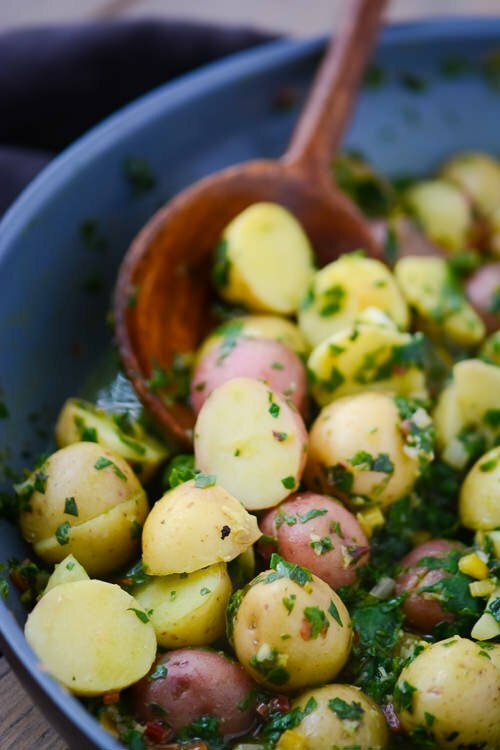 Simple boiled potatoes get dressed up with finely chopped chard in a garlicky lemon broth. Light on calories but full of flavor! 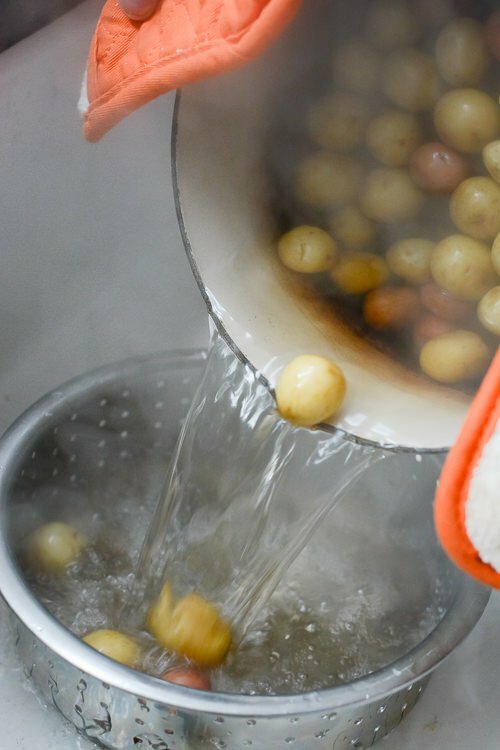 Put the potatoes in a large saucepan, add cold water to cover by an inch and season generously with salt. Bring to a boil, reduce the heat, and simmer until potatoes are fork tender, about 10-12 minutes depending on their size. Drain and halve the potatoes if large and set aside while you prepare the broth. 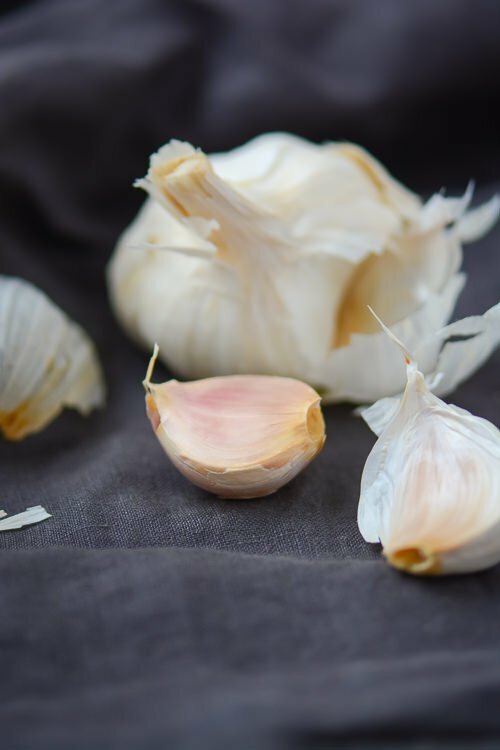 Add the finely chopped garlic along with the tablespoon of olive oil over low heat to a large skillet and cook for 4-5 minutes until the garlic starts to sizzle and becomes fragrant. Roughly chop the chard and add to the pan along with ½ cup of the stock. 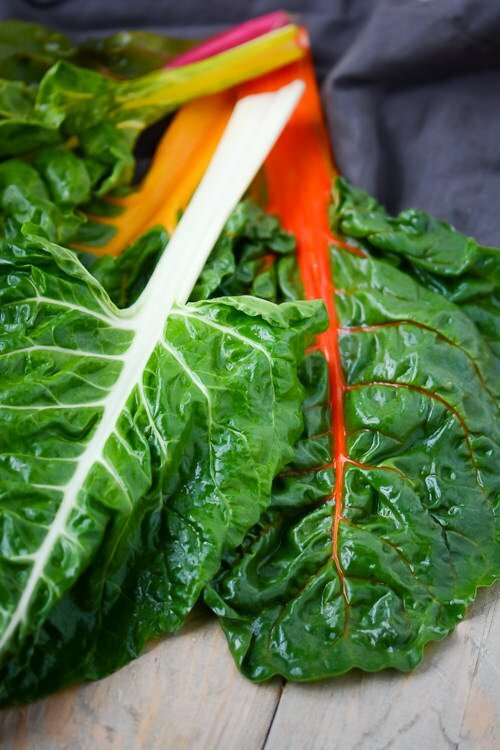 Cook for 2-3 minutes or just until the chard starts to wilt. 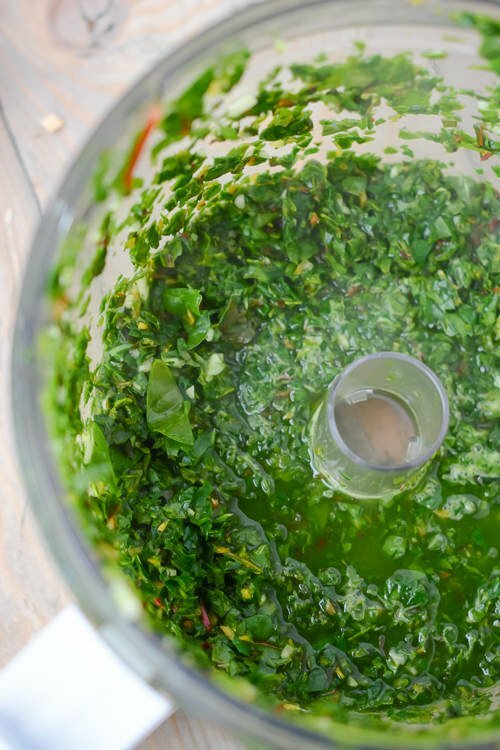 Add the chard to the bowl of a food processor or blender and pulse until the chard is finely chopped. Add the potatoes and chard mixture back to the skillet along with the remaining ½ cup of stock and the lemon juice. Cook over medium heat until the potatoes are heated through. Taste and season with salt and pepper. I have a big bunch of chard that I wasn’t sure what I was going to do with. This looks like a good plan! 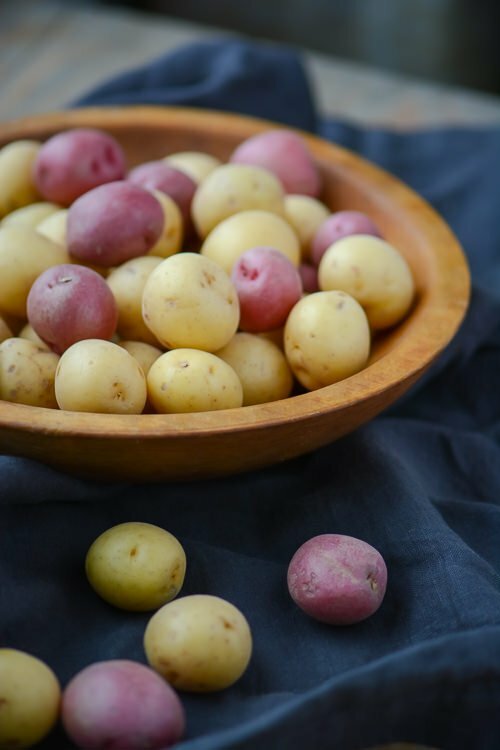 It’s perfect for those bits of greens you have hiding in your produce bins and we usually have some potatoes hanging out! Hope you like it if you try it! Potatoes are definitely on the agenda at our house! So good. 🙂 I really like the idea of serving them in a broth like this–super simple and yet still unexpected. I have to confess I had something similar to this in a restaurant years ago and always meant to try and reproduce it at home. I think I got pretty close! I love all leafy greens and it’s nice to try and use them in ways that are slightly unexpected. I hope you enjoy the recipe if you give it a try! Potatoes are not bad for you at all, as long as you leave the fat off of them. When cooked, they are actually beneficial, but got a bad rap with the low carb diet phase. Unfortunately, the majority of potatoes eaten in the US are fried like fries or chips, or loaded with butter and sour cream. This looks like a great recipe, but I’ll skip the oil. 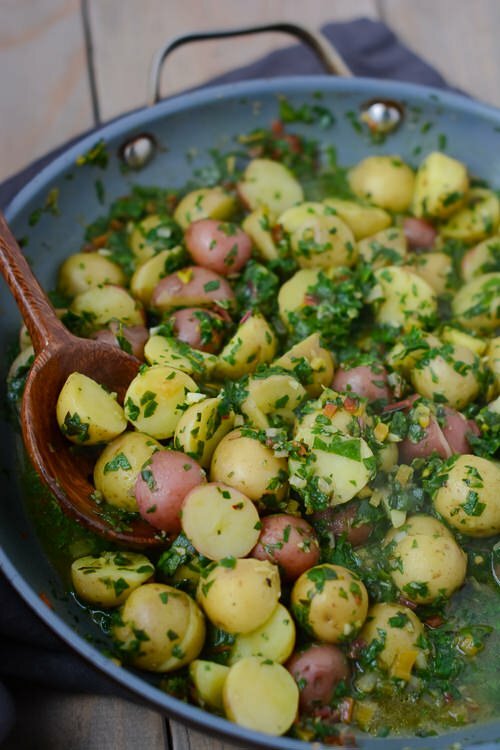 Chard goes so well with potatoes, thanks! I’m going to make this recipe for dinner tonight… Curious as to the reason to chop the chard after lightly sautéing first? I finely chopped the chard so that it would coat the potatoes, now that I’m thinking about it you could pulse the chard before you sauté it but that was the way I prepare it when I make it. I hope you enjoy it! I can relate to a husband that doesn’t like greens. We have a bit of a constant struggle here since we all have food preferences and none of them are the same. My son is getting more adventurous and is willing to try more things but I think the husband is a lost cause at this point! Any leafy green works well. I usually just look at what’s in the fridge, spinach, kale and beet tops are all delicious in this recipe. Let me know if you have any success with other options!